Summary from GoodReads: Every girl wants what she can’t have. Seventeen-year-old Gloria Carmody wants the flapper lifestyle—and the bobbed hair, cigarettes, and music-filled nights that go with it. Now that she’s engaged to Sebastian Grey, scion of one of Chicago’s most powerful families, Gloria’s party days are over before they’ve even begun . . . or are they? 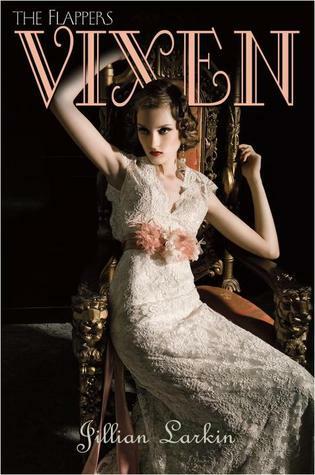 If you forced me to choose between Bright Young Things by Anna Godbersen and Vixen by Jillian Larkin, I'd have to tell you that my answer--and new favorite set in the 1920's--is Vixen. Yes, they have some similarities--the era and three main characters--but Vixen is much more so focused on the speakeasies, prohibition, and flappers than I found Bright Young Things to be--although you could attribute this to the fact that Bright Young Things is set later in the era. In Vixen, our three main characters are Gloria Carmody, Lorraine Dyer, and Clara Knowles. Gloria is engaged to Sebastian Grey--who is publicly against speakeasies and flappers--and she wants nothing more than to become a flapper and experience a sort of freedom that she has never had before. Lorraine Dyer is Gloria's best friend; she also happens to be insanely jealous of Gloria and she's also got a crush on Marcus--another of their friends. Lastly, there's Clara, my favorite character from Vixen. She's been sent to live with her aunt--and thus Gloria--to help plan Gloria's wedding and to effectively keep out of trouble after a stint in New York City during which she was completely engulfed in the flapper lifestyle. However, someone from New York has followed Clara to Chicago and he's been leaving her notes--more importantly, she's afraid that all her hard work of playing the 'good girl' will go to waste if he shows up. Meanwhile, she's falling in love with Marcus, Lorraine is starting to get friendly with Sebastian, and Gloria finds love with a piano player. Needless to say, I really enjoyed reading Vixen and I'm looking forward to Ingenue which is currently set to be released on August 9, 2011. Each of the girls was certainly an individual and I'm personally partial to Clara and her relationship with Marcus--if you couldn't tell by now. Unfortunately I can't really say much more than that without including spoilers. I will, however, tell you that to me, Vixen is a very good embodiment of the 1920's and what the era makes me think of. It's weird that all these books about the 1920s are coming out now. I love the 1920s though, I'm getting married soon and I'm thinking of having a 1920s inspired dress. Ooh. Sounds very exciting! I've been wanting to read this one. I don't think I will enjoy this more than Bright Young Things, because that one just BLEW MY MIND. But I'll indefinitely enjoy this one. Thanks for the review! Wow, sounds really good! Thanks!! Loved your review of Vixen. I'm really looking forward to reading it. I didn't fall in love with BYT like I thought I would, so maybe I'll fall in love with this one instead! Ohh, I have been dying to read this! I currently have "Bright Young Things" sitting at home waiting TBR but I'm so excited about Vixen. Thanks for the review! I also gave you a Stylish Blogger Award over at my blog! Hello love, I have this book on the shelf... I can't wait to pick it up! You have a wonderful blog and I'm letting you know with an award. I plan to read this one soon, it sounds like so much fun! Also I gave you the Stylish Blogger award!